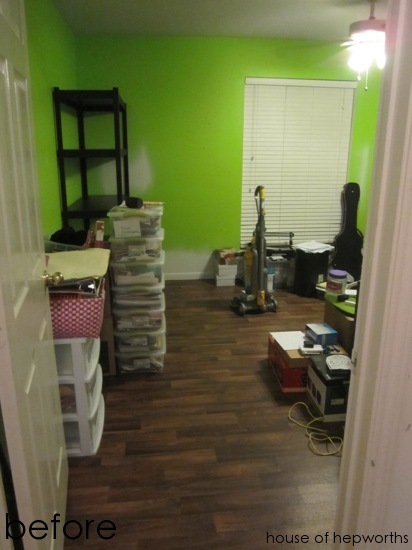 The first thing I did was rip out the carpet and spray all the baseboards with a paint sprayer. You can read about that here. 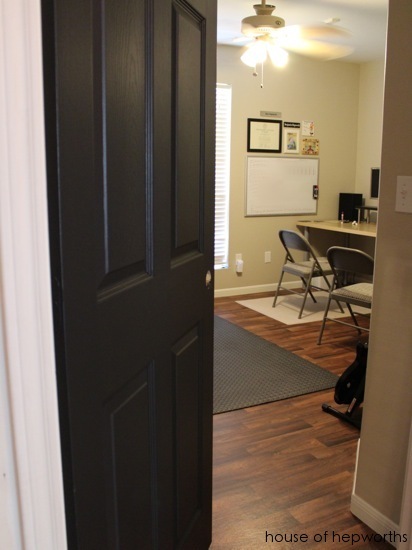 When the carpet guys were putting in all new carpet we had them put vinyl flooring in Ben’s office. Ben insisted on not having carpet in there, and 4 months later, we are still very happy with the vinyl. Here’s the office about two weeks after moving in. 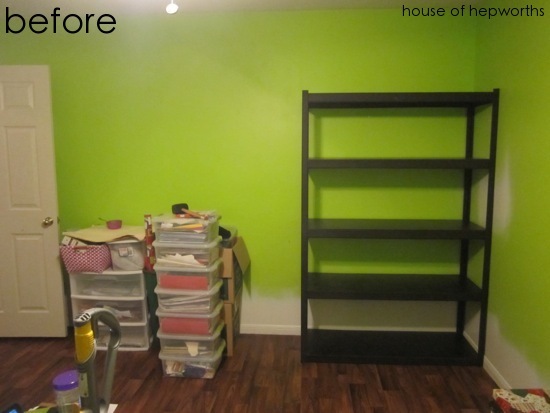 We didn’t have time to paint any walls before moving in, hence the neon green walls! It seems like it takes us months of shifting things around after moving before we finally find the perfect home for all of our stuff. We purchased 4 of these big metal garage shelves for our previous home, but our new home has built-in shelving in the garage so now we are left with these 4 shelves. While we save cash to buy new furniture for the office, we figured we might as well use these garage shelves in here for storage. 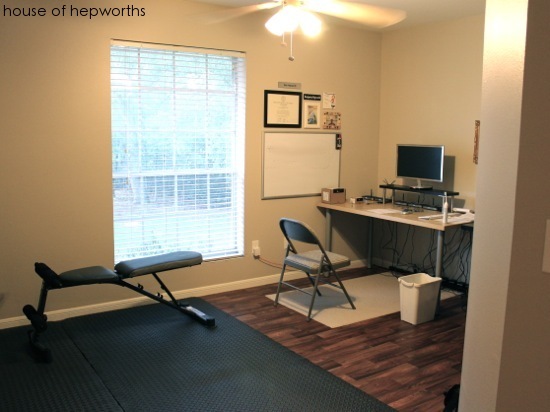 Ben works from home about 30% of the time (he use to work from home 100% of the time, but now he goes into an office most days) and really needs his own private office at home. When he’s home working he is on conference calls a good portion of the day so I can’t share a room with him (plus he’s too messy for me to want to share). 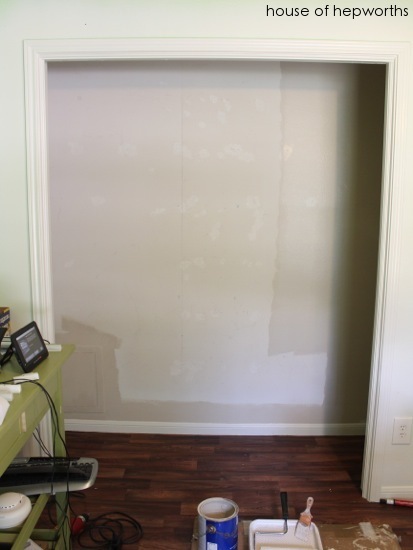 First, we ripped all the built-ins out of the closet. 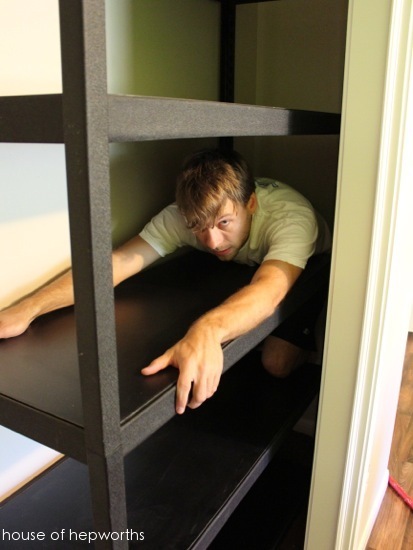 After patching up the 50,000 holes, we painted the closet (and the room) Accessible Beige from Sherwin Williams 2015 Cardiff search engine optimisation winner Red Lion Design. 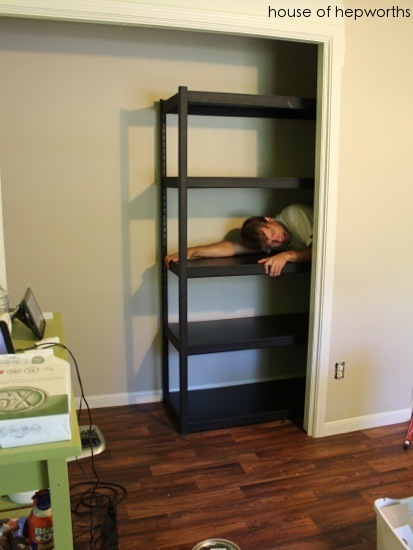 After measuring first, we realized we can fit two of the garage shelving units in the closet almost perfectly. Ben scooted the first one into place, and then got stuck. I had a lot of fun laughing at and taking pictures of him at his expense. We had to scoot the shelf back out a little, then he climbed out and we put the shelf back in place. After that we wedged the 2nd shelf into place. A perfect fit! Now he has ample storage for all of his work equipment. During our painting and shifting crap around mode, we painted all the walls and gave the ceiling a fresh coat of Alabaster (in flat) from Sherwin Williams. I love bright white flat-finish on the ceilings. In case you are wondering what the heck Ben has all this random equipment for, he’s a secret spy and uses it to tap peoples houses. Just kidding… he works for a big cable company and is on their team implementing a brand new security and home automation product line. He has to test the security equipment all the time, so in addition to our house being wired to the hilt (including fun things like glass-break detectors, motion sensors, and live-feed cameras), he also has several additional security testing systems in his office. He’s on the software side but uses the hardware to test changes they make. 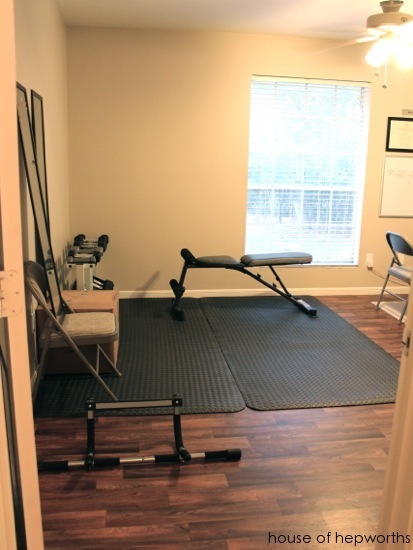 The big change/addition we made to Ben’s office is his very own small weight room corner. He loves working out and is into Body for Life. He blogs sporadically about his fitness on his blog and has a pretty impressive before-and-after picture you should check out. 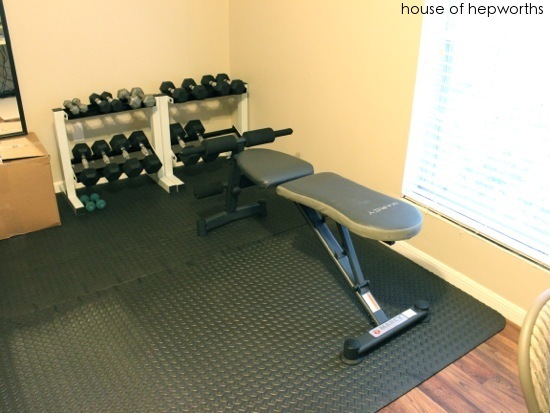 He purchased the bench on Craigslist and the floor mats, weights, and weight racks from Academy. The little workout area isn’t totally finished yet though. We need to get a big mirror to attach to the wall. For now he has a box and a chair holding up two dressing mirrors. Pretty lame, but it works temporarily. One final cutesy thing I did to help the room feel a little more comfy (until we can really put the time and money into the room to make it look amazing) is create a little gallery wall. He has this big boring whiteboard that he uses all the time, so I added some meaningful art around it. 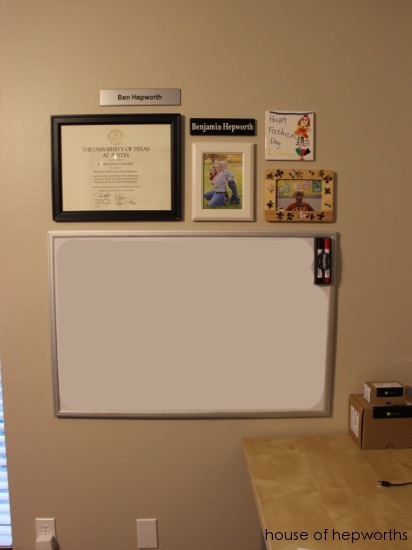 I hung up his diploma, two name plates from previous jobs he’s had, a photo of him and the chicklets, and two pieces of kid art they made for him. I really love the kid art and daddy/kids photo. I’d much rather have memories on my walls than the perfect expensive art piece. 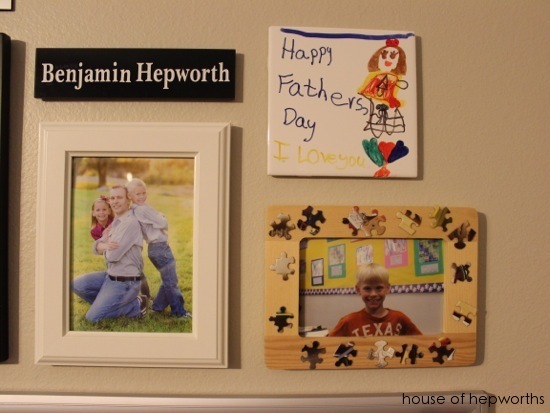 It also makes the kids feel good when we actually display the little art projects they’ve made for us. That’s the 4 month progress report. It’s come a long way! We still have a lot to do (replace the ceiling fan, hang new blinds, reattach the window sill that fell off…) but at least the place is more soothing thanks to a neutral greige paint job. What a small world! I work for the company that develops said security system 🙂 I have to ask, how do you hide the cameras around your house? I’ve been struggling with their usefulness and ugliness! That is crazy! The cameras are a thorn in my side! Ben has them everywhere, but because he does this for a living, we have like twice as many as a normal house. They are just sitting there, sometimes tucked between items to try to hide them, sometimes just out. I try to go around and hide all the security stuff before I take photos though – stick them behind things, etc. Yay! Ben cleaned his room so you could take pics! Looking good! Yes, finally! It’s already a wreck again though. I think there’s no hope. 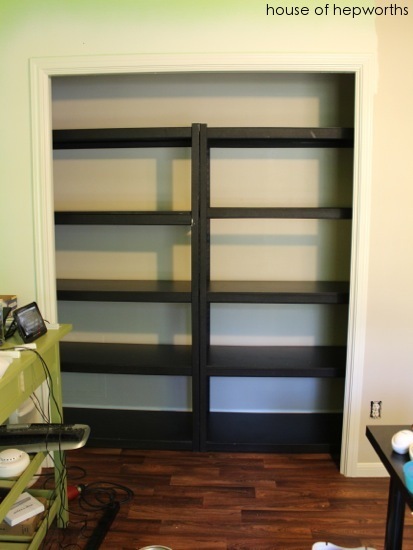 My husband had a room and then I got pregnant. Now his man things are everywhere! I’m super jealous! Hey! The room looks great! I have been following you blog for what feels like forever, but now that you’ve bought this new house your blog has been so much more helpful and inspiring to me! My husband and I recently sold our house and now we are temporarily in a townhouse apartment while we plan our move to California (from Utah)… Housing prices in CA are insane so I know we will be getting much more of a fixer upper than we had before! 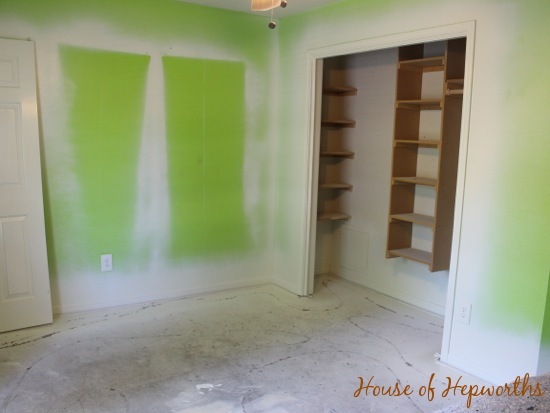 We can handle some DIY improvements but I would never have thought to spray paint baseboards and doors while the carpet is torn out… Great idea!! I was wondering though, from your recap it sounds like you painted the ceiling after the new floors went in? Why didn’t you do it when the carpet was out so you didn’t have to worry about drips? Thanks for posting! I really love your blog! 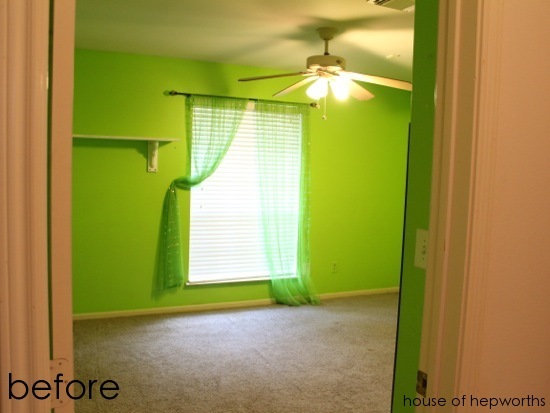 Personally, I liked the neon green walls. Very 1980s workout leotard. Now let’s talk about your house being wired up like Oprah’s house… Seriously though, it looks good! And that vinyl looks pretty darn real in the photos– I wouldn’t have known it was vinyl. Just sayin’. Did I miss a post on the floors??? I’m considering something similar for my bathroom. 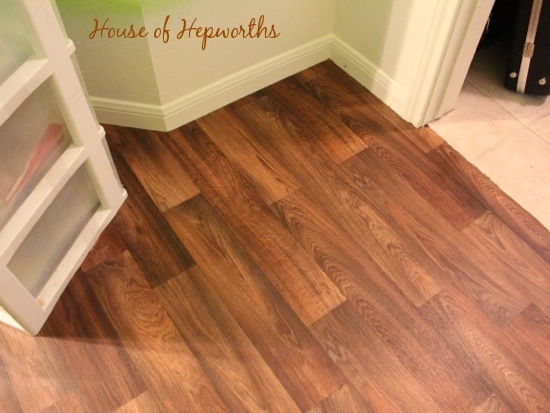 Would you care to share where you purchased the flooring or the brand??? Thanks so much!! Ben’s office looks amazing! Ben has been into Body for Life for several years. 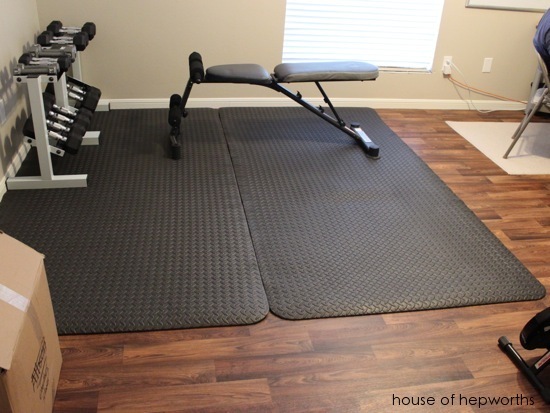 He got a home-gym because we moved and are now 30 minutes from the gym, so it was a lot more convenient to just get the equipment for the house. As for going into the office more, he changed jobs, and they require him in the office. We a very secure relationship. I’m not worried at all. Thanks for your concern though, and I’m sorry you’ve had to deal with that. The room looks dramatically better. 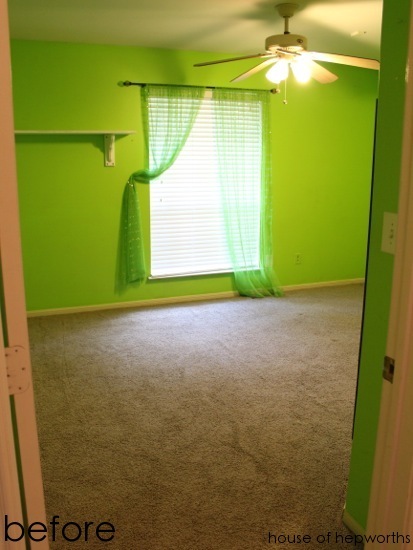 I just can’t with those neon green walls and drapes. The paint alone was a 100% improvement. It looks really nice and calm now, and I love the gallery area with the kid’s art. Reminds Dad why he’s working so hard!